Last year, I signed us up for a local bread delivery service. The idea’s pretty awesome – one person buys loads of bread, breadbuns and pastries and drives round all the houses delivering them in time for breakfast, instead of everyone heading out to the bakeries individually, mostly in their cars. The trouble is, the bread isn’t nearly as good as the bread we can buy at our nearest bakery. It isn’t even as good as it was at the beginning. I think they must have changed the providing bakery at some point during the year. DB says he’s willing to cycle to the better one at weekends so we don’t really need them anymore. I keep meaning to cancel the subscription but I never think about it until I see the bag of bread buns hanging on the gate and then I head to work and forget about them until the next week. Yesterday morning, when I went to open the front gate to let the car out, the buns I’d forgotten to cancel hung in their plastic bag on the gate handle, the way they always do on Mondays..
…Then I noticed a second plastic bag. This one was sitting on the top of the dustbin, minding its own business. The dustbin lid is a good place to put things – it’s hidden behind the gatepost, and even if anyone notices a plastic bag, they assume it’s rubbish that didn’t quite fit in the bin. Friends have been known to leave books and handcream, fish food and goodness-knows-what-else on the bin for us. When they do, they write or phone to tell us. This time, though, I hadn’t heard from anyone. That meant either DB had put it there himself or he’d arranged for someone to drop something off. The bin wasn’t full, and DB is very orderly in his own way*, so that means he was an unlikely suspect. I unhung the bread bag, picked up the mystery bag and turned back towards the car. It was heavy for its size, and squidgy, in a crunchy sort of way, like a bag of damp sand. 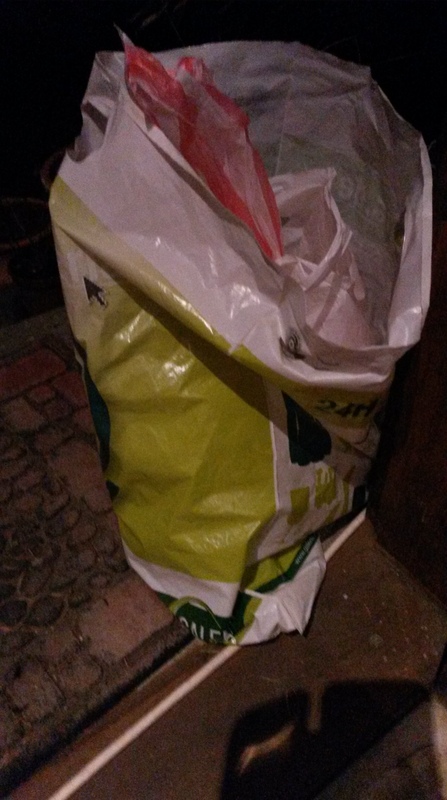 I looked inside (because I’m nosy and not feline enough to feel scared of curiosity) but I couldn’t see anything interesting because the contents, whatever it was, had been put into smaller bags, which in turn were in a small bag inside the bag on the bin. I’m not curious enough to actually open other people’s stuff so I went to find DB. DB hadn’t heard from anyone either and was more interested in leaving for work in time than finding out what was in the bag, so I left it on the porch, got in the car and forgot all about it. DB followed me onto the porch, picking up the bag on the way. After a few seconds of bag squishing, he put it down and said we probably ought not to open it at all, and to call the police instead. A very patient but rather confused police officer listened to me tell him about finding the mysterious bag, then asked me what I wanted him to do about it. I thought that part was his job, but I suggested he might want to see and/or collect it. He agreed that that might be a good idea and promised to send a colleague round to pick it up. The colleague arrived over an hour later. He listened to the story (which really isn’t that exciting when you think about it), looked at the dustbin, picked up the bag, peered inside with a torch, pulled out one of the smallest bags, crunchy-squidged it, laughed and pronounced it to be salt for de-icing roads. He took it with him to throw away in his dustbin since whoever had put it on our dustbin hadn’t wanted it in theirs, and we hadn’t wanted it in ours. Off he went, mysterious bag in tow. Which is all very well, and I’m glad it’s gone, but it leaves me wondering a) why anyone would wrap salt in small bags before getting rid of it in someone else’s garden and b) how he knew what it was without even opening the bag. DB says it’s probably crystal meth and the police didn’t want to scare us, but I’m pretty sure people don’t leave 3 pounds of crystal meth in other people’s gardens. I shall probably never find out what it really is, and that’s going to bother me until I forget about it – which probably won’t take long if the bread bun subscription is anything to go by. Talking of bread bun subscriptions – now would be a good time to cancel one. I’m on a train and have nothing else sensible to do. The catch? (because there’s always a catch) it’s an English train and I don’t fancy another huge roaming bill.. Maybe later when I have Wifi – if I remember…..
* as long as it doesn’t involve the garage or the workshop or the sitting room table. You’ve watched too many episodes of Breaking Bad clearly. Though why anyone wants to de-ice your bins is strange – in fact the expression ‘de-ice your bins’ sounds like a Breaking Bad euphemism for breaking a Meths’ addiction.